Businesses need to run like well-oiled machines to keep their customers happy, but all that oil can really do a number on the carpet. That’s where we come in. We’ve been servicing the Tahoe area for over two decades. In that time, we’ve made it our business to keep your business looking clean and professional. Clean carpet doesn’t just look nice for your customers and employees, it’s also conducive to a healthier workspace, and it even lasts longer. Dust and abrasive material in the carpet can lead to increased wear and tear, resulting in the need to replace it sooner than if you had cleaned it regularly. This means keeping a clean carpet is not only better for your business’ appearance, but it’s easier on your wallet as well! Steam cleaning, also known as hot water extraction, involves the use of a specialized piece of equipment that evenly disperses heated water while simultaneously vacuuming the water back up along with dislodged and dissolved soil from deep within the carpet fibers. This is the industry standard process recommended by carpet manufacturers as the most effective means of cleaning the carpet. Steam cleaning can also increase the longevity of your carpet by removing dust and abrasive particles that can wear out your carpet faster, which can result in the need for costly replacement. Additionally, the hot water extraction process removes pollutants and allergens from the carpet. This means your office will not only look and smell more professional, but the air quality itself can also improve – resulting in less sick days and call-outs from your employees. It’s recommended to have a professional, steam cleaning treatment done at least twice a year for high traffic volume areas. Regular cleanings help keep you and your carpet healthier for years to come. 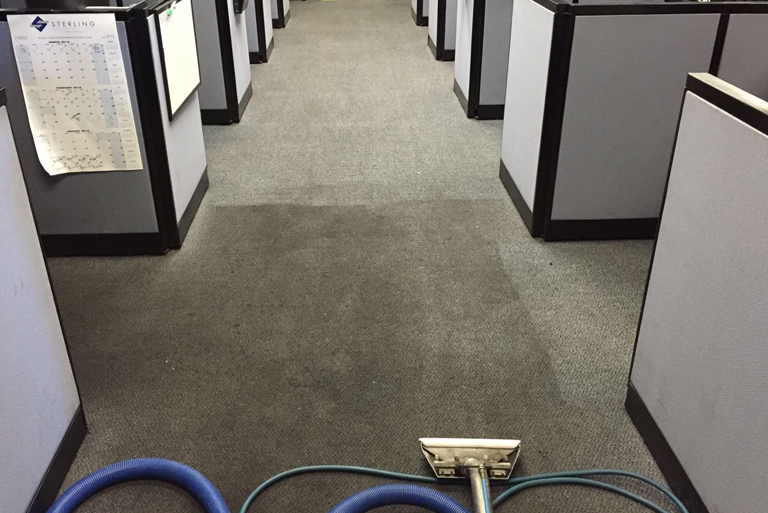 Our commercial carpet cleaning service won’t just cover up the stains but will remove the dirt and grime trapped deep within the fibers of the carpet. Our process is tough on dirt but gentle on carpet. Keeping your carpet in tip-top shape will create an environment your customers and employees can enjoy while also preventing unnecessary wear and premature aging of the carpet itself. Kinney’s Carpet Care technicians will provide quick, friendly service that will have your office carpet looking new again. We will schedule a time that works around your busy schedule and ensure all areas are back in working order with minimal downtime. Our hot water extraction process allows for fast drying times so that you can get back to business as soon as possible. Those plastic and rubber wheels can leave streaks on the carpet over the course of a day’s work and hours on end of computer users’ feet remaining in the same location can lead to staining as well. Our office carpet cleaning service can erase these unsightly marks. Areas that have a lot of foot traffic get all sorts of dirt and grime ground into them day after day which can form visible paths of dirt in your carpet. Our expertise will have your carpet looking brighter and uniform in no time. We sure do love our coffee, but the carpet doesn’t seem to appreciate it like we do. That staff meeting with the free pastries went off without a hitch, except for the ganache that dripped onto the floor. We’ll bring that carpet back to its glory days with our professional spot treatment. We provide top-notch services at reasonable rates that have kept customers coming back for years. You don’t have to take our word for it though! Kinney’s Carpet Care has been a Better Business Bureau accredited business with an A+ ranking for over a decade. Customers seem to agree as well – we are very proud to have a Five Star Rating full of satisfied customer reviews on Yelp. We guarantee your satisfaction with our services. Let us show you why we have been a trusted provider of carpet cleaning services in Tahoe for over two decades. Call or fill out a request form now so we can schedule an appointment and have your business back in working order in no time.